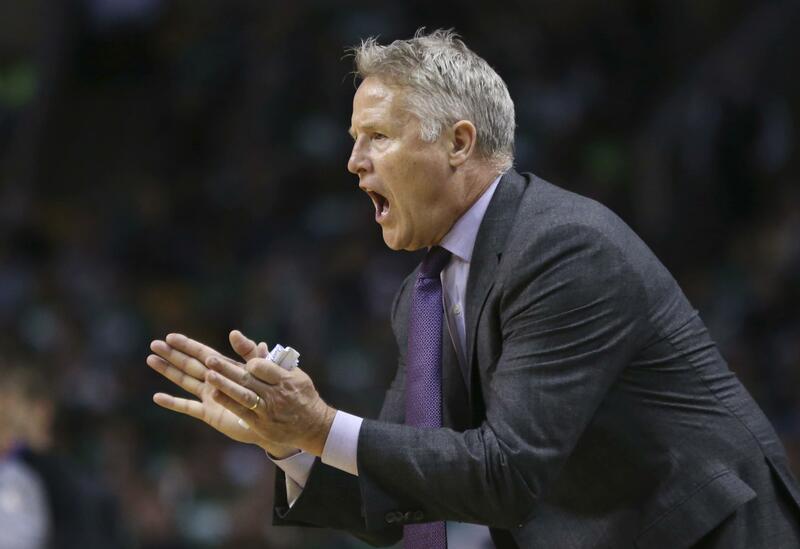 Tue., May 29, 2018, 9:22 p.m.
PHILADELPHIA – The Philadelphia 76ers will continue to put their trust in coach Brett Brown. Brown, who took the 76ers from 10 wins to the third seed in the Eastern Conference in just two seasons, has agreed to a three-year contract extension that runs through the 2021-2022 season. A person familiar with the situation confirmed the deal to The Associated Press. The person spoke Tuesday night on condition of anonymity because the contract has not been officially announced. Brown had one year left on his contract. The extension is a sign the franchise believes he’s still the right coach to lead the Sixers into Eastern Conference contention. The Sixers won 52 games this season and beat Miami in the first round of the playoffs before they were eliminated in the conference semis by Boston. Under Brown’s watch, Joel Embiid and Ben Simmons have blossomed into two of the top young players in the league. Brown was hired as the Sixers were about to undergo their rebuilding process that became known as “The Process.” The 76ers won 19, 18 and 10 games in each of Brown’s first three seasons. The Sixers won 28 games in 2016-17 and made the first playoffs this season for the first time since 2012. Even with two 26-game losing streaks on his resume, the front office has never wavered in its feeling that Brown is the right coach for a franchise that last won a championship in 1983. Brown is 127-283 (.310) with one winning record in five seasons. Team president Bryan Colangelo said days after the Sixers were eliminated he planned to offer Brown an extension. “I don’t think it’s the healthiest of situations for coaches to go into a season with one year remaining on their contracts. It impacts so many aspects of what you’re doing,” he said. Brown was part of three NBA title teams with San Antonio as an assistant and won another with the Spurs when he served in the basketball operations department in 1998-99. He left after that season to become the head coach of the Sydney Kings of the Australian National Basketball League, but rejoined the Spurs in 2002 as the team’s assistant coach/director of player development and was moved to the bench as an assistant under Gregg Popovich in 2006. He signed a four-year deal for his NBA first head coaching job in 2013 with the understanding the Sixers were trying to rebuild. But he would later admit he had no idea the 76ers would struggle so badly four years into a tenure filled of coaching developmental league castoffs and 10-day contract players for a shot at building a winner through lottery draft picks. “To coach gypsies or to have to coach a revolving door is not what I am looking for,” he said in 2015. But help was soon on the way. Embiid was named All-NBA second team, Simmons is a leading contender for NBA rookie of the year and the Sixers still believe they can salvage something out of Markelle Fultz. Fultz was the No. 1 pick of the 2016 draft but was sidelined most of the year with injuries and hardly played in the postseason. The Sixers are at least $25 million under the salary cap headed into the offseason and Brown said the Sixers need to be players in the free-agent market if they want to take the next step. And the 76ers believe Brown is the right coach on the bench who can help bring them one. Published: May 29, 2018, 9:22 p.m.